Attempting to perform tree service on your own tree can always be a touch uncomfortable. Since it’s a living thing, it’s fragile and it’s hard to tell when you’re disrupting the delicate balance that your tree needs to survive. Don’t fret, some things need to be handled by a professional, and others don’t. If you have overexposed roots branching off of your tree and disrupting the landscape of your yard, you can take care of it without much fuss. Overexposed roots can be charming in the right environment, but unless you live in a castle, and don’t need to mow your own lawn, they can be a pain. A few species of tree are known for being repeat culprits of this kind of growth, such as maple trees, beech trees, willows, and quaking aspen. Depending on the tree and how those roots are growing, they can be unsightly. They damage your mower blade when you inevitably roll over them. They disrupt other ecosystems in your yard, they’re tripping hazards and they have the ability to press up through the ground to unbalance the stones in your walkways. They’re more of an inconvenience than a charming addition to your home. So how can you take care of these obstructions without upsetting your tree? Most people determine that they should cover these exposed roots with a load of topsoil. However, if you’re interested in the health of the tree itself, this is strongly discouraged. 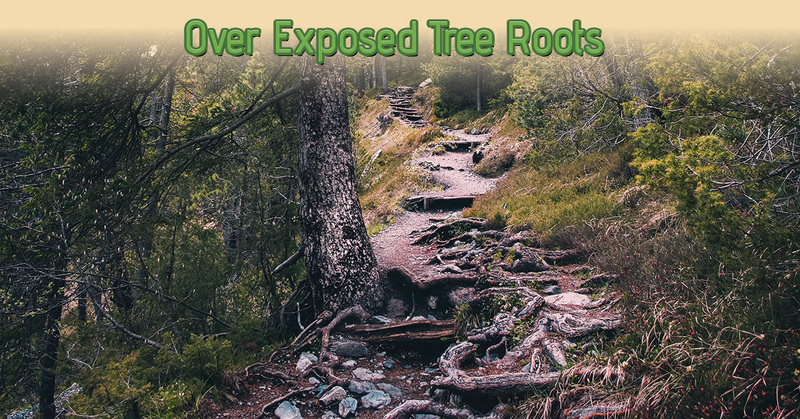 Tree roots need oxygen, thus, dumping a thick layer of dirt onto the top of them can easily suffocate them. Exposed roots are actually a sign of your tree not getting enough oxygen anyway, so covering them up would only exacerbate this problem. However, everything in moderation applies to this issue as well. If you were to sprinkle a small amount of soil over the exposed roots in a couple stages, this will give your roots time to acclimate. Just make sure that you’re not covering the roots with enough soil to start a shade garden, as that will make it harder for your tree to adapt. This “small amount of soil” looks like 2 inches of soil over the top of the roots. The best practice in this scenario would be to mix in some compost with the soil before applying the layer. This will make your mixture lighter, and more breathable for the tree. Place grass seeds over the top of the soil to give it a touch more permanence. Check again after a year, if the soil didn’t hold, repeat the procedure. Other possibilities for covering roots that are a little more aesthetically pleasing include mulch and a layer of potted plants. In some cases, you may have to call in a tree service company to perform some maintenance on the tree. This will most likely result in tree removal, unfortunately. If you’re in need of tree removal service for your Birmingham home now due to those pesky roots, be sure to give Halo Tree Service a call. Browse our services on our page if you have any questions, we’re happy to offer a fair quote for our services and we pride ourselves on our excellent customer service.